Correct: Kokopelli is a whimsical figure. Incorrect: I saw a kokopellis on coffee mugs today. Examples: You can't really buy "an actual" Kokopelli because he is a spirit. You can find Kokopelli on shirts, logos, and all kinds of products. The following article was contributed by Cheryl Joseph, formerly of Kokopelli's Kitchen. Kokopelli was the predominant figure in the religious landscape of the Southwest, from 500 A.D. through 1325 A.D., until the development of the Katsina Cult. Kokopelli is most typically viewed as a fertility deity and is still worshipped by many Native American tribes in the Southwest. He is also thought to be a trickster, traveling salesman, insect, musician, warrior, and hunting magician. What Does Kokopelli Look Like? His likeness varies almost as much as his legends. He is usually shown as a humpbacked flute player, often with a large phallus and antenna-like protrusions on his head. Some images show knobby knees and clubfeet. These physical deformities, along with the humpback and permanent erection, are the results of Pot's Disease, a form of tuberculosis. It is thought by some that Kokopelli's humpback may have evolved from a sack that was slung over his shoulders. The contents of his sack vary as much as the legends. The sack may have contained goods for trade. This is based upon the beliefs that Kokopelli represented early Aztec traders, known as Potchecas, from Meso-America. These salesmen would travel from the cities of the Maya and Aztec with their goods in sacks slung across their backs. These traders also used their flutes to announce themselves as they approached a settlement. More commonly, it is thought that Kokopelli's sack was full of gifts. According to a Hopi myth, Kokopelli's sack contained babies to be left with young women. At San Idelfonso, a Pueblo village, Kokopelli is thought to be a wandering minstrel with a sack of songs on his back who trades old songs for new. 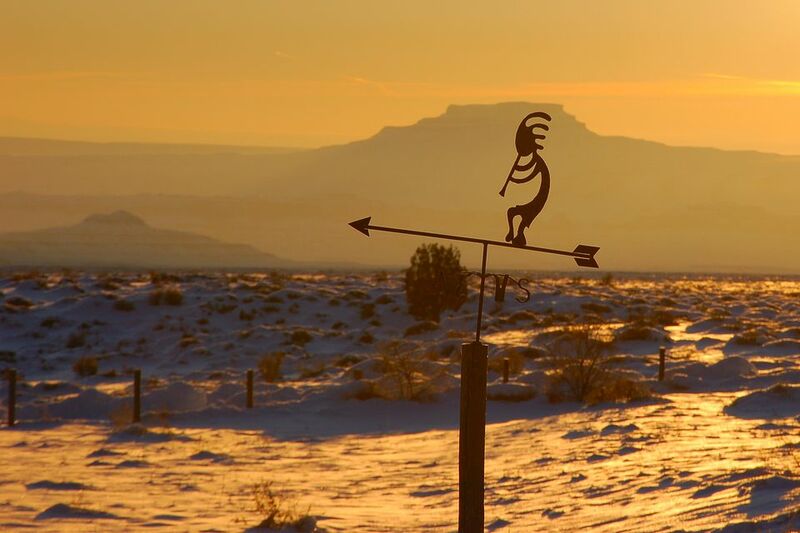 According to Navajo legend, Kokopelli is a God of harvest and plenty. It is thought that his sack was made of clouds full of rainbows or seeds. Kokopelli is one of the most widely recognized images today. He can be found on many items such as clothing, furniture, golf balls, key rings, and Christmas ornaments -- some die-hard fans even have a Kokopelli tattoo! Kokopelli's Kitchen is a company with its own line of specialty foods all produced in Arizona and specially packaged. All of the products offered by Kokopelli's Kitchen are indigenous to the great Southwest, and all the foods (except the cocoas) are free of additives and preservatives. The corn, beans, spices, and other ingredients were largely used by the prehistoric Indians to create the foods they enjoyed and that carried the people from one growing season to the next.